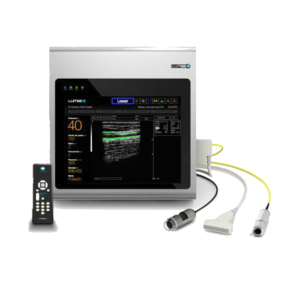 Lumia SonaBeam TD is an infrared laser equipment high power, which is suitable for surgical and transdermal treatments. The standard wavelength is 980 nm (40 W), but optsialno available wavelengths of 810 nm (30 W) and 1470 nm (12 W). High quality image XGA (1024 x 768 pixels). High speed connector for Ethernet (10, 100, 1000 Mbit / s) for automatic software updates, and send images and data of color Doppler ultrasound via email. The amount of memory available for storage in the system is 3 GB. Transdermal treatment is applied when using the unit Lumiia Sonobeam TD in dermatology and carrying out procedures such as Laser hair removal, treatment of vascular reticular veins and ulcers, hemangiomas, hypertrophic scars and keloids, dark spots, hyperpigmentation, age spots and warts, dark tattoos, acne scar treatment acne, rosacea treatment, photorejuvenation flabbiness, stretch marks, and generation of new collagen. For this type of treatment uses a special transmitter multifokusny. The emitter is responsible for the transfer of energy of the laser radiation generated by the equipment to the application of the patient. It is connected to the equipment via a fiber optic switch. The area of ​​the laser beam is set at the end of the separator and this area is called a spot. Spot circular shape and its diameter is a measurable function. The laser system Lumiia Sonobeam TD has been successfully used for invasive and minimally invasive operations in the field of vascular surgery and phlebology, plastic surgery, general surgery and proctology, thoracic surgery, gynecology, urology, dentistry, otorinolarinogologii, traumatology. For this application, a special surgical fiber optics (optical fiber front). It is connected to the output of the laser through the plug connector on one side and the other end is usually channeled. The light guide is designed for 25 operations. This is the most common delivery method of the laser beam used in surgery to cut or coagulate. The operator determines the length of the waves with the help of a foot pedal. Thanks to specialized software Lumiia SonoBeam laser beam can be emitted in a pulse form and is used in dermatology and aesthetic medicine. The duration of the wave is determined by the operator, and ranges from 5-900 milliseconds. In this mode, regardless of the length of how the operator presses the pedal, the equipment generates one pulse in the range of 5-900 ms wavelength programmable in accordance with the installed capacity. To give new impetus to, the footswitch must be released and pressed again. This mode is used when it is desirable to use a precisely controlled energy. Maximum power 40 W pulse generation, pulse output adjustable up to 1 watt. The laser device used in our equipment is a 980 nm laser based on InGaAsP / Ga As (indium phosphide, gallium arsenide). Diode technology replaces other existing technologies due to its high stability, long life, small size and efficiency. The wavelength of 980 nm has a high absorption in the dark pigment, giving an advantage in its physiological effect on the pigments, such as melanin and oxygenated hemoglobin. Thus, it is a useful tool for working on the principle of selective photothermolysis for removing stains, unwanted hair, etc. The laser can be used in continuous or pulsed mode without contact tissue selectivity, and can cut any soft tissue. It can be used in the pulsed mode, to cut and coagulate without bleeding in surgery. Foot switch is the only piece of equipment that allows you to apply laser energy to an object. It is covered with a protective cap that prevents accidental pressing and a blue LED status. The camcorder has DermatoView® hundred fold (200x) magnification and allows the visualization of the dermis. The image captured by the camera is displayed DermatoView® equipment. Lamp intensification imaging veins VeinBrowser® allows you to visualize the veins through a combination of LEDs that enhance the contrast in their tissues. For ease of operation, the lamp is wireless. Surface (transdermal) and deep (puncture) laxity.